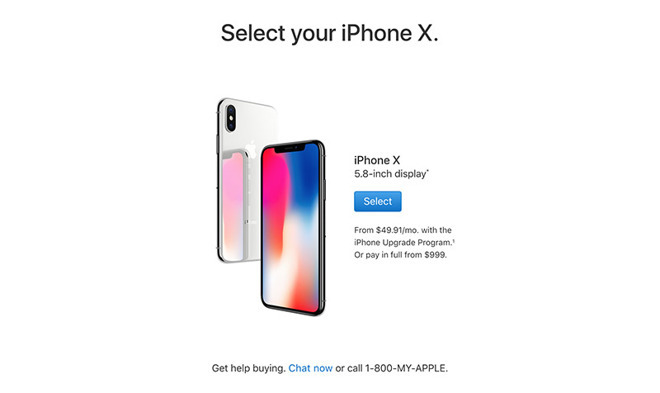 As scheduled, Apple took iPhone X preorders live on Friday shortly after 12:01 a.m. Pacific, through the dedicated Apple Store app for iOS and the Apple.com online storefront. Apple's app was first to gain access to preorders, followed by Apple.com, after a brief delay, while carrier sites followed. This year's preorder rollout appears to be moving much more smoothly than past product launches, though initial stock is already showing signs of depletion. Today's iPhone X sales debut comes after last month's iPhone 8 and 8 Plus release. Variants of the outgoing iPhone 7, the iPhone 8 and 8 Plus come with incremental upgrades like faster internal components and updated camera. The exterior design was also altered to incorporate a glass back for wireless charging. Unlike iPhone 8, iPhone X is only available in silver and space gray finishes with 64GB or 256GB of onboard storage. Prices start at $999 for the 64GB version and $1,499 for the higher capacity 256GB model. In addition to the handset, Apple introduced new leather and silicon cases for the full-screen smartphone, as well as an iPhone X Leather Folio that sells for $99. Like iPad Smart Covers, the Folio case interacts with a Hall sensor embedded in iPhone's power button to sleep or wake the device's screen. Apple is launching iPhone X in 57 regions including Andorra, Australia, Austria, Bahrain, Belgium, Bulgaria, Canada, China, Croatia, Cyprus, Czech Republic, Denmark, Estonia, Finland, France, Germany, Greece, Greenland, Guernsey, Hong Kong, Hungary, Iceland, India, Ireland, Isle of Man, Italy, Japan, Jersey, Kuwait, Latvia, Liechtenstein, Lithuania, Luxembourg, Malta, Mexico, Monaco, Netherlands, New Zealand, Norway, Poland, Portugal, Puerto Rico, Qatar, Romania, Russia, Saudi Arabia, Singapore, Slovakia, Slovenia, Spain, Sweden, Switzerland, Taiwan, UAE, the UK, the U.S. and U.S. Virgin Islands. For more on iPhone X, check out AppleInsider's hands-on with the device. Update: Apple exhausted its initial supply of iPhone X units in about ten minutes. Current shipping estimates as of 12:11 a.m. Pacific are pegged at two to three weeks for all models. Update 2: Apple is performing carrier checks for certain unlocked iPhone X models.